User's story 7: Daily products | IBE TECHNO CO.,LTD. 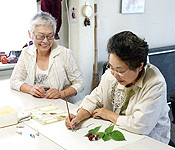 Mrs. Yoko Nakane is a representative of "Gallery Space No.3" where she has been teaching drawings for 17 years. Now her students count more than 100. She has been pursuing the good way of life as a woman. It used to be said that "woman should do this" in her young period. She hates being classified as such. So she has always been a working woman. She usually talks to her female students, "feel how you feel now and discover the new things by observing in detail precisely and drawing one pitch by one pitch with the best concentration, then you can find the next step forward the future." She gives a "Hooray!" to modern women through the drawings. Mrs. Nakane clings to not only the way of life and but also daily goods around. Her favorite is "Piâge" a multipurpose detergent concentrate and "π-clean", a bacteria and odor remover. "I'm very sensitive for the ingredients and color additives in goods because my mother told me not to use bad things for my body. I always have reactions against harmful things. But products from IBE are very good. I've never felt uncomfortable with their products. I can use them without troubles." She utilizes "Piâge" and "π-clean" in various ways in her home affairs such as washing dishes, sterilizing a cutting board, cleaning filters of air conditioners, deodorizing laundries and the room. She lives on her own choices - indispensable drawings for her joyful life and indispensable daily goods for her rich life. She has been teaching drawings for 17 years. 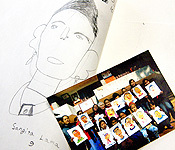 She also teaches to children in Nepal in volunteer activity. There she dares to go to slum and show the joy of drawing. She always takes "π-clean" with her whenever she goes abroad. She uses detergent made of "Piâge" and "π-clean" for washing dishes. "For a dish washer, one push amount will be enough. It is good that the small amount will work enough. 1 liter of each lasts for one year. It is a cost saving." She sprays "π-clean" many places in her house. One bottle of "π-clean" is placed by her bedside. She says, "Spraying on the pillow and linens removes smells of the head and body."